This recipe is from The Joy of Cooking. When I make them, I make cloverleaf rolls (3 small balls of dough in each muffin tin), and the recipe usually yields 24 rolls in my normal size muffin tins. I never refrigerate the dough, I bake the rolls all at one time, and freeze the ones I don’t need for another time. 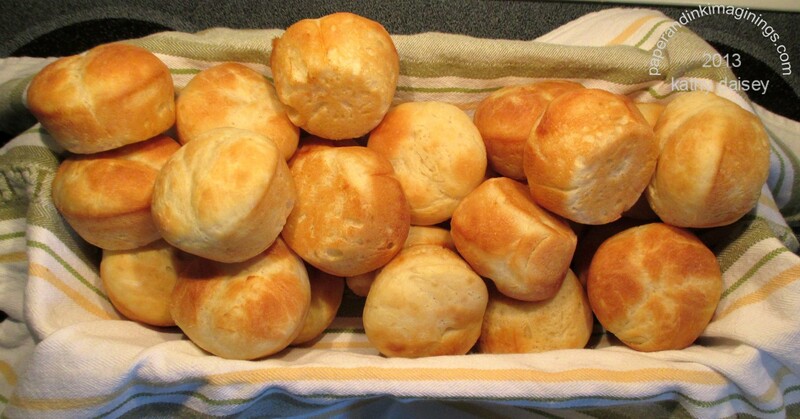 Instead of me retyping the recipe, I found it online in another blog, Rather Be Baking No-Knead Dinner Rolls. Watch the baking time – I find mine are done in 10 – 12 minutes (not 15 – 18 minutes as stated in the recipe link).